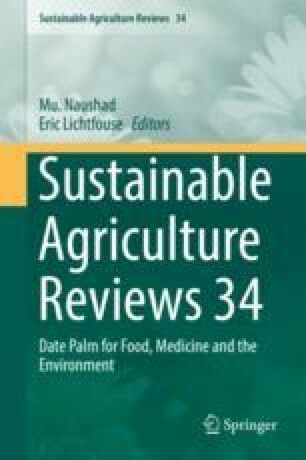 This chapter highlights on the nutritional and antioxidant constituents of dates. Date palm (Phoenix dactylifera L) assumes a vital role in traditional treatment. Dried date fruit serves as the staple food in many countries of the world for a considerable period of time. Dates are found to be rich in carbohydrates (77.13 g/100 g), predominantly glucose and fructose, but low in proteins (2.61%) and fats (0.35%). Date fruit offers a wide range of essential nutrients and potential health benefits. They also serve as a good source of many vitamins, dietary fiber, minerals, phenolics, carotenoids and antioxidants. Nutritional and medicinal activities of date fruit are related to its chemical compositions, mainly phytochemicals. Due to these important functional compounds, dates exhibit various health benefits by preventing various diseases. Date fruit has antioxidant, anti-mutagenic, anti-inflammatory, gastro-protective, hepato-protective, nephro-protective, anticancer, immune-stimulant activities, antidiabetic, hypocholestrolemic and many other. The chapter likewise depicts the techniques by which the date varieties were shown to exhibit strong antioxidant activity. Considering the detailed information on nutritional and health promoting components, dates are deliberated as an ideal supplement, providing a wide range of essential nutrients and potential health benefit to mankind.